Once you click the ‘Submit Disclosure’ button, you will land on the page below. 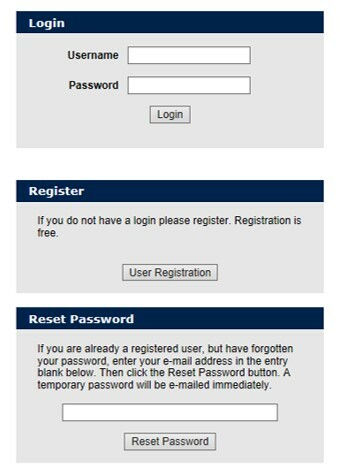 If this is the first time you are submitting an invention to the Innovation Institute, please register as a new user first by creating a unique credentials that can be same as or different from your Pitt user id and password. If you are an existing user, please log in the system using your credentials. 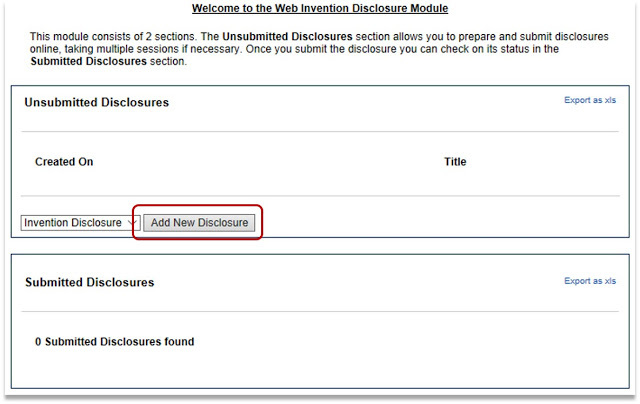 On the Welcome page, click ‘Add new Disclosure’ button to start recording information on your invention. 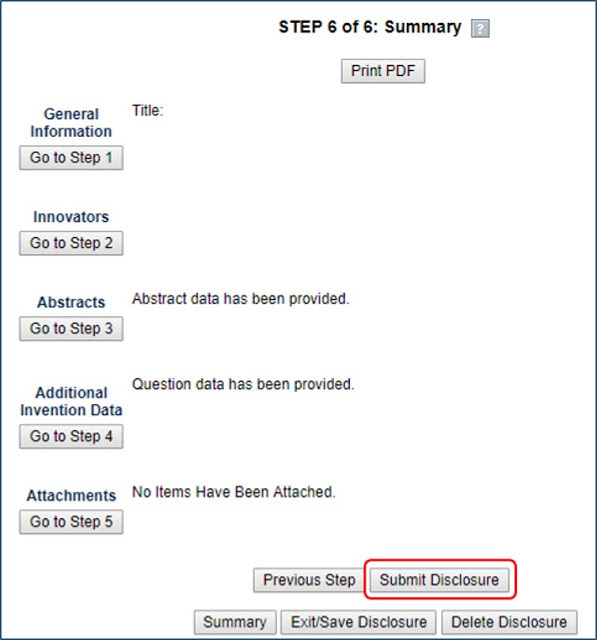 This will lead you to a six-step module for preparing and submitting the invention disclosure form. Here, name the title of the invention that you are submitting and select the most appropriate IP type that fits with your invention. List the names of all Pitt and non Pitt innovators. 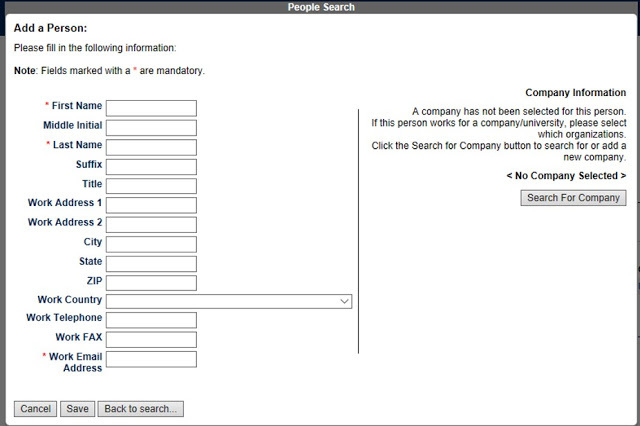 Click ‘Add New Innovator’ button and search for the innovator in People Search Database. If the innovator is not found in database, proceed to ‘Add New Person’ to fill-in the details of the innovator. Every time a new innovator is added, a new window appears that allows you to choose the lead innovator of the invention. Include a detailed description of the invention including how it works, what problem it solves, and what are the benefits, features and known applications. 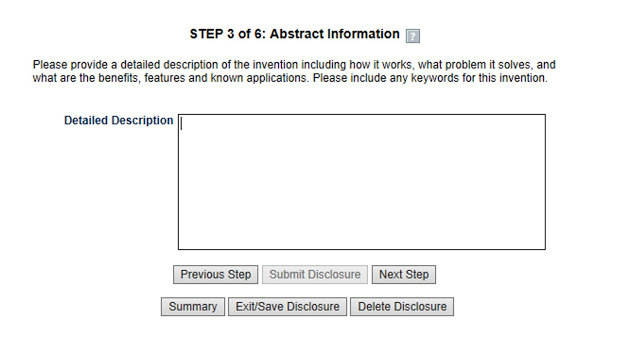 This is a mandatory step to submit the invention disclosure form. This step is comprised of six sections that requires filling-in additional information on invention that will help the Innovation Institute evaluate how to protect your invention and its commercial potential. (a) Main (Novelty and Stage of Development): This section asks you to list novel aspects of your invention and to provide information on the stage of development of the invention. (b) Invention Information (Prior art): Include any scientific article, patent or patent application, or any other public information that you think closely matches with your invention. (c) Sponsorship (Funding and Other Agreements): This sections requires information on any funding used to develop the invention and any other agreement (such as a MTA, CDA, sponsored research) with an outside third party associated with this research. (d) Disclosure Dates: List any past or anticipated disclosures to outside third parties on your invention. 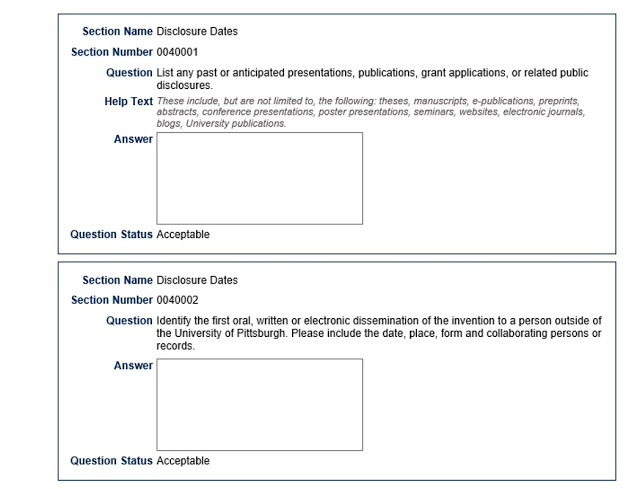 (e) Joint Inventors: If any innovator listed in Step 2 has an appointment or joint appointment outside of the University of Pittsburgh, list the names of such innovators and their outside affiliation in this section. (f) Commercialization Interest: List the name of any company that you think may be interested in commercializing your invention. Attach any relevant information related to your invention that you would like to share with the Innovation Institute. Examples of relevant information include, but are not limited to supporting data, manuscript, publication, poster, abstract, slide presentation etc. The last step of the invention disclosure form provides you with a summary of the information that you have provided so far. 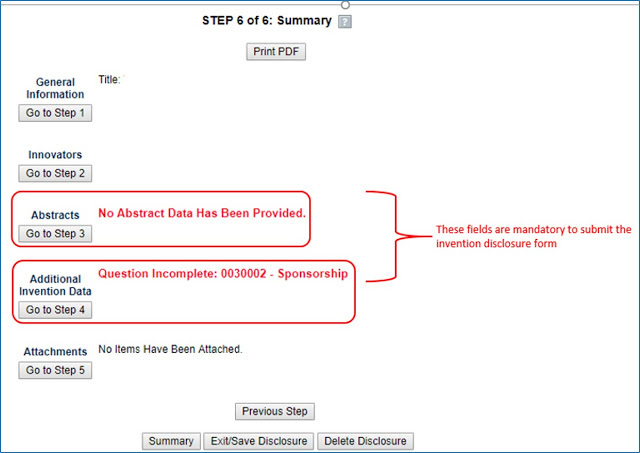 Please note that information on Abstract (Step 3) and Sponsorship (Section c of Step 4) need to be completed in order to submit the invention disclosure. 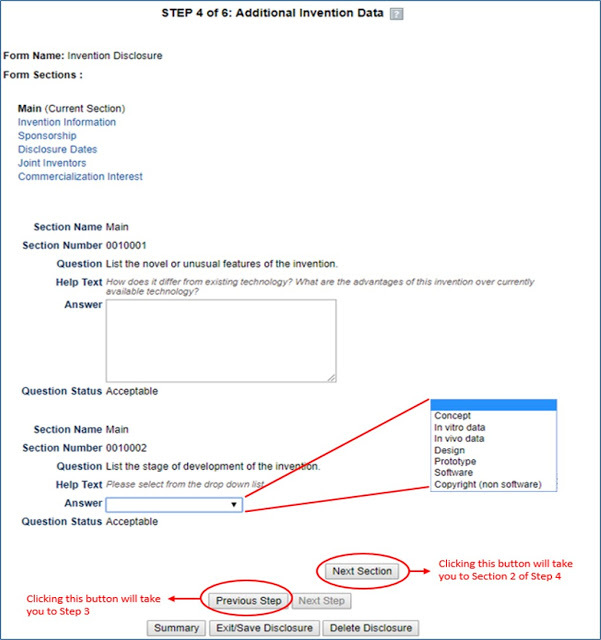 Once you have provided all information on your invention, click the ‘Print PDF’ button to generate and save a pdf copy of the completed invention disclosure form for your records. 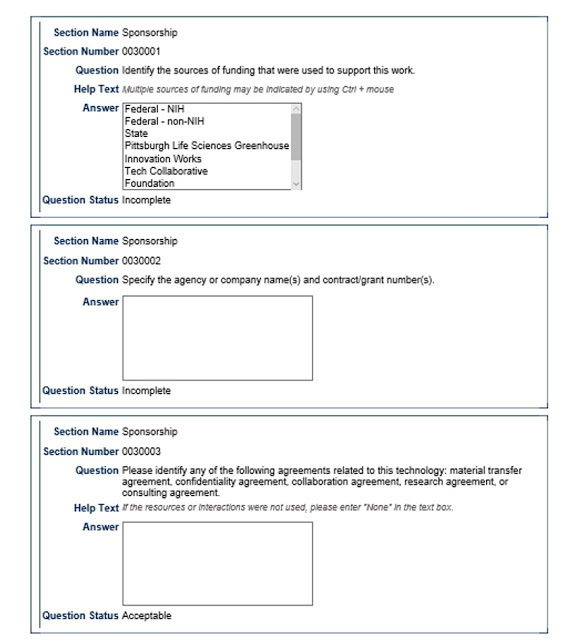 Once a copy of this form is saved, click ‘Submit Disclosure’ button on the bottom to successfully submit your invention disclosure form to the Innovation Institute. After the invention disclosure form is successfully submitted, you will see a thank you note which will also ask all innovators listed on the invention disclosure form to sign the ‘Acknowledgment and Assignment for the University of Pittsburgh’ (for Pitt innovators) and ‘Acknowledgement for Non-University of Pittsburgh Innovators’ (for Non-Pitt innovators) portion of the submitted invention disclosure form. 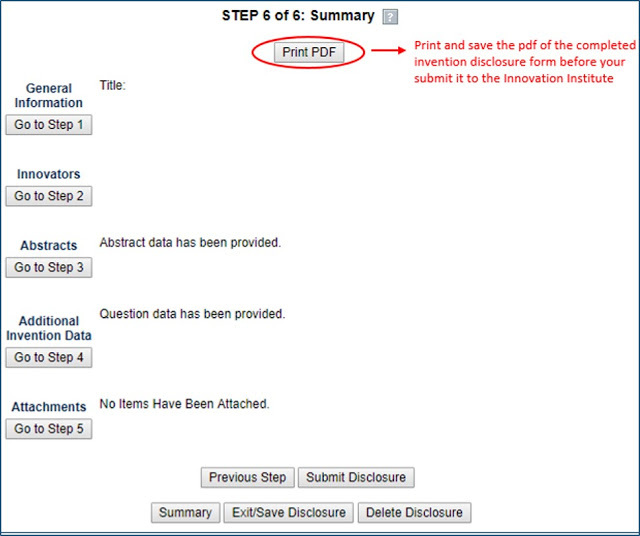 If you didn’t save the pdf of the invention disclosure form before submitting it, you can do so now by clicking the ‘Download PDF file’. 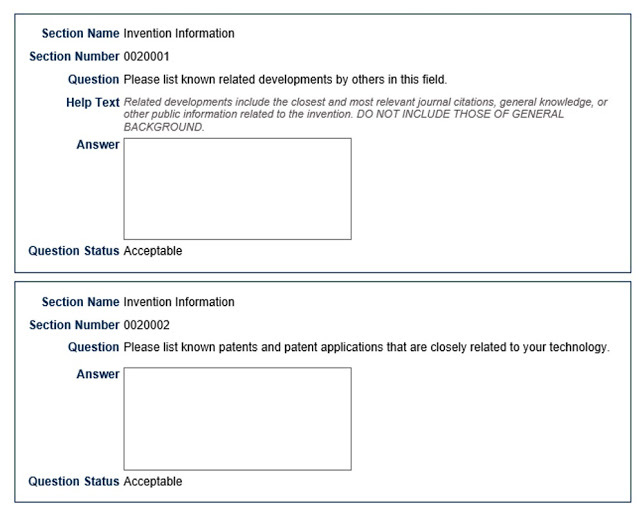 Once all the innovators sign the invention disclosure form, send the original signed form to the Innovation Institute.